"Pray like this. The Hearts of Jesus and Mary are attentive to your prayers." O Divine Eternal Father, in union with Your Divine Son and the Holy Spirit, and through the Immaculate Heart of Mary, I beg You to destroy the Power of your greatest enemy-the evil spirits. 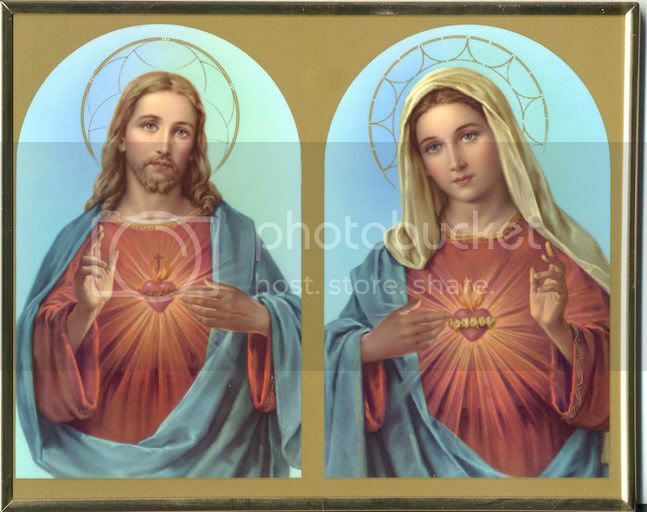 Heavenly Father, give us the reign of Sacred Heart of Jesus and the Immaculate Heart of Mary. Sorrowful and Immaculate heart of Mary, dwelling pure and holy, cover my soul with your maternal protection so that being ever faithful to the voice of Jesus, it responds to His love and obeys His Divine Will. I wish, O my Mother to keep unceasingly before me your co-redemption in order to live intimately with your Heart that is totally united to the Heart of Your Divine Son. Fasten me to this Heart by your own virtues and sorrows. "Sacred Heart of Jesus, I implore that I may ever love You more and more." "Sacred Heart of Jesus, I place my trust in You." "Jesus meek and humble of Heart, make my heart like Yours." "Sacred Heart of Jesus, Thy kingdom come." "Sacred Heart, have mercy on me." "Sacred Heart of Jesus. May you be known, loved and imitated." My loving Jesus, out of the grateful love I bear you, and to make reparation for my unfaithfulness to grace, I give You my heart, and I consecrate myself wholly to You; and with Your help I purpose to sin no more. Amen. First-To expiate all the sins I have committed this day and during all my life. Second-To purify the good I have done badly this day and during all my life. Third-To supply for the good I ought to have done and I have neglected this day and during all my life. "Have pity on the Heart of your Most Holy Mother. It is covered with thorns which ungrateful men pierce it at every moment, and there is no one to remove them with an act of reparation." Mary, our hope, have pity on us and pray for us. O Mary, my Queen and Mother, remember I am all thine. Keep me and guard me as thy property and possession. Amen. "O my Jesus, I offer this for the love of Thee, for the conversion of sinners, and in reparation for all the sins committed against the Immaculate Heart of Mary. "